A Black Hole is Not a Hole is a thrilling in content and language. It is a rare nonfiction book written for younger readers–although I believe it has wide appeal–that is exciting and accessible. A longtime astronomy enthusiast, I find the study of astronomy and its many amazing phenomena to be fascinating. Decristofano’s book brings that excitement and wonder to life! 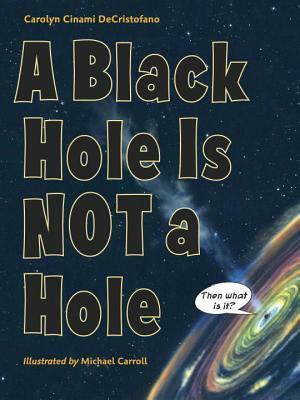 Although accessible to young readers in its explanations A Black Hole is Not a Hole does not ‘dumb down’ any scientific research, information or explanations. Instead she uses examples from everyday life to illustrate some of the more intangible or confusing aspects of a black hole in space. One of my favorites is when she states very plainly that it is difficult to search for something that IS nothing. A black hole is an absence of matter. So how do you look for a black hole in space? You can follow clues! The clues are like footprints in a crowded forest–maybe you see them and can follow them, but maybe paw prints, branches, leaves, and shadows muddle the picture. This explanation gave me a vivid image of tracking in the woods, looking down at the ground and trying to discern which were the tracks I was following among all the other things covering the ground. For example, one of Earth’s closest black-hole “neighbors” is about 1,600 light years away. (That’s about 9 quadrillion miles, or 14 quadrillion kilometers.) No spacecraft is going to get you to a black hole and back by dinnertime–even if you live to be one hundred and only want dinner on your last day. Because there are not photographs of a black hole or of some of the other phenomena discussed Decristofano uses artist’s illustrations to further engage and enlighten her readers. Michael W. Carroll’s illustrations are a perfect complement to Decristofano’s text and the book is filled with these visuals in glossy, spectacular color. I will not claim to completely understand all the information about black holes after reading this book because it is packed with information. But I have a significantly more informed concept in my experience now. Decristofano tells her readers that “A black hole is a destination–for your imagination.” A Black Hole is Not a Hole makes the trip a doozy!